Lighten up barbecue parties, backyard cookouts and make any holiday one to remember with these. These hand-sewn bib style fashion aprons are must-have kitchen accessories for the trendy cook who prefers practical, affordable and fun to wear aprons. These Cooking Aprons are easy to wear - simply slip over head, tie in back. A center pocket in front. All Unisex Bib Aprons really should fit just about anyone. These beautiful fashion aprons come in a variety of styles, patterns and prints. Made by hand in USA. Our best seller in Cooking Aprons, the Sweet Gingham Fashion Apron is an eye-catching number that sets the tone of your next barbecue - fun, laughter-filled and food galore! This bib apron is designed to fit perfectly for just anyone who loves serving exotic flavors! It is reminiscent of some vintage prints from retro years. This bib apron is perfect for those cook-outs and barbecues this summer when things can get hot and spicy. This will likewise fit a Mexican. Spanish or Cuban menu . . . This colorful apron will be stand out in any kitchen. It can go from the kitchen and beyond. 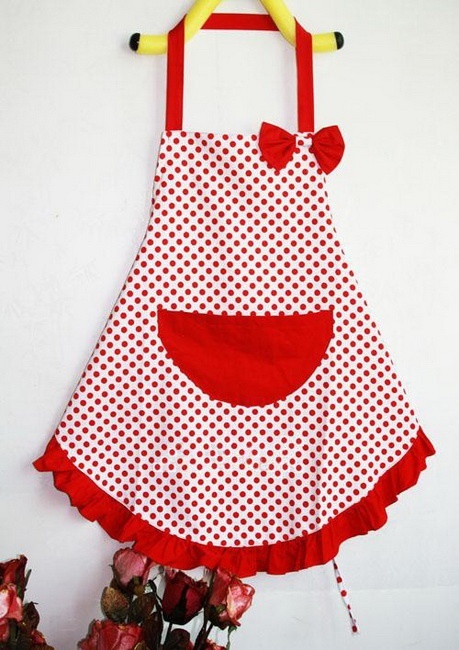 This hand-sewn bib style fashion aprons is a must-have for your everyday kitchen. Features an adjustable neck strap with Stainless D-Ring slider. One Large Bistro Style pocket on Front. Reinforced stress points to last under tough conditions.